Many parrots still have their wings clipped. In this article, Greg Glendell explains why clipping is not necessary and may even cause more problems than it can solve. It sometimes comes as a surprise to bird keepers (who may only know parrots in captivity) that most wild parrots are ace-aeronauts. And they have to be for one very simple reason: to escape being caught by an equally skilled hawk intent on catching a parrot for food. Wild parrots which can escape such attacks at high speed and can fly with precision in a tightly packed flock are the ones who survive to live another day. So what has this to do with the pet bird in your home? Well, we are always reminding ourselves that parrots are not really domesticated birds, but remain essentially the same as those in the wild; this is very true! Throughout their long history of evolution, parrots have refined their flying abilities for the sake of sheer survival. And the parrot in the home has retained all the instinctive behaviours found in a wild bird vulnerable to attack from predators. In fact the bird’s whole body, behaviour and lifestyle is adapted for flight. Due to this evolutionary history, flight is also vital to a parrot’s health and well-being even when it is in captivity. A flying creature cannot get effective aerobic exercise merely by climbing around, no more than a dog can get effective exercise unless it is able to run around each day. Pet parrots which do have regular daily exercise by flying are also strong, fit and healthy birds. Flight is as vital for a bird as running is for dogs or horses. How parrots learn to fly. When baby parrots fledge and leave the nest, they have a strong natural urge to fly, though they don’t have the skills for precision flight; these skills can only be acquired by experience. All birds (both wild ones and pet birds) are clumsy for a while during this stage. Just like a human toddler learning to walk instead of crawl, the birds will have accidents. They may crash-land and misjudge distances when landing. Birds in captivity have two extra problems to overcome when learning to fly. First, there is the problem of taking off in the still ‘dead’ air of a room. In the wild, the bird would normally experience the wind and turn instinctively into this to take off and land more easily. Second, a lack of space. Learning to fly within the confines of a room is both difficult and unnatural. The bird has insufficient space to gain any speed before it then has to find somewhere to land. In the wild, it might fly a great distance before finding a suitable place to land, then prepare itself as it approaches the perch. Fledgling parrots tend to follow their parents on early flights, and rely on them to show them where to land. With this in mind, as the bird’s main carer, you should replicate this guidance by showing your bird which places you would like him to use as perches to land on, but do this before the bird is asked to fly to these places. So, just use the ‘Step up’ and ‘Step down’ requests to get your bird used to a range of places in the room(s) he has access to. This might include the backs of chairs, a table, settee, window-ledges etc. Pet birds also need to be taught about the problems of large-pane windows. It’s best to make these invisible barriers more obvious to the bird by hanging net curtains at them or sticking something on the window such as diagonal strips of dark masking/duct tape (birds may try to perch on horizontally arranged tape). Once the bird is familiar with the window, the tape can be removed. At first, young birds are not aware of the extent of their own wingspan and an Amazon or African grey, with a wingspan of about 28 inches (75cms) may collide with a door post as it tries to fly through. However, after a few attempts, they learn the trick of tucking the wings in to pass through any gap narrower than their wingspan. So, given the time and space in which to learn, pet parrots soon acquire the skills to fly well, though this may take a few weeks. You will see a big change in a young bird’s flying abilities as soon as it learns how to apply the ‘air-brakes’. It does this by dropping its tail feathers and using some reverse thrust with its primary feathers as it comes in to land. Following acquisition of these skills the birds fly with much greater confidence and control. The bird will soon have better speed control and use its tail and a banking manoeuvre to change direction as well as reduce speed. To land properly, the skilled flyer swoops up to the perch while the tail is dropped down. This allows it to reduce speed. At the point of landing (and unlike aircraft) the bird has to stall -to ensure zero airspeed as it reaches the perch. Then, it twists its primary feathers forward to brake as it puts its feet out to grip the perch. Clipped birds will still sometimes attempt to fly, but the loss of their primary feathers causes another problem; crash landings. Clipped birds cannot use their primaries for reverse thrust, so they are often forced to crash-land. This can result in injuries. As part of their normal development, parrots are ‘programmed’ to learn to fly in the first few weeks of leaving the nest and it is vital that all young captive-bred birds be given this opportunity. Good breeders will always encourage their birds to fly as soon as the bird’s natural urges reveal the desire to take to the air. Soon after fledging (the natural point at which the bird leaves the nest) it will put on weight as it develops its powerful pectoral muscles on the chest. Also, the heart will grow to its normal healthy size and be able to beat at around a thousand beats per minute, as is required for flight. Young birds fledged naturally will be very much fitter and stronger birds than those that have not had such opportunities to fly. With this in mind, it is common sense that young birds should never be wing clipped. Clipping at this stage could affect both their mental and physical health badly for the rest of their lives, so this should never be done. So Why clip at all? To prevent the bird escaping. To control a bird’s ‘dominant’ behaviour by limiting its ability to fly. Because the owner (or breeder) feels it is safer for the bird. Because the owner doesn’t feel comfortable having a bird that can fly around the house. Although the first three reasons may seem acceptable there are problems with these as we shall see. However, the fourth reason is simply not acceptable: anyone who is not at ease with birds flying near them should consider the many alternative animals which can be kept as pets. In truth, many birds are also clipped merely as a routine or default practice, without really thinking about the true effects on the bird of this procedure. There are many different types of clipping which vary in their severity, but essentially there are two methods: either a one-wing clip, to deliberately unbalance the bird should it attempt to fly, or a symmetrical clip to both wings, which is meant to allow safe downward flight, but prevents lift. The first method, where most of the primary feathers on one wing are cut off at the level of the wing coverts, is very crude, indeed very cruel. This clip can threaten the safety, indeed the life, of the bird. Birds have spent millions of years evolving as highly skilled flying creatures and symmetry is vital to them. To undermine this by deliberately making a bird unbalanced may also threaten the bird’s mental well-being. Birds clipped on one-wing which then fall on any hard surface are vulnerable to fractures and bruising to the breastbone, broken limbs, head injuries and even death. Parrots often start feather plucking a few weeks after such crude clipping and this problem can be impossible to cure in many birds. A light but even clipping of both wings is less harmful to the bird. The intention here, is that the bird will be able to fly down and land safely, but it will be unable to fly up (cannot generate lift). However, should such a bird get outdoors, it may be able to gain enough lift by facing into the wind and fly fairly normally. So, the dilemma with clipping is that while it denies the bird lift in the still ‘dead’ air indoors, it cannot stop a bird flying outdoors if there is some wind blowing to aid lift. All birds, clipped or not, are vulnerable to some dangers. If a full-winged bird escapes it may go a considerable distance, especially if it panics. However, clipped birds are vulnerable to different dangers. For example, they tend to walk on the floor more, so they are more likely to be trodden on or caught by a door opening or closing onto them. People with severely clipped birds may be less cautious about leaving their external doors open. If such a clipped bird escapes, it may not get very far, but it is more vulnerable to attacks from dogs or cats or being run over by a vehicle when outdoors. 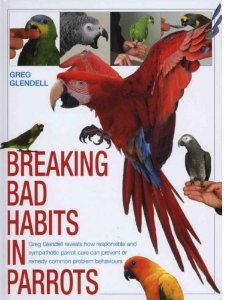 All flying birds, including parrots, have an escape response to danger which is both instinctive (not a learnt behaviour) and is a reflex action (the bird cannot control this action by a conscious decision). The escape reflex action is caused by many aversive stimuli that the bird receives. This may be a ‘real’ threat, such as the close approach of a person or animal the bird fears, or some perceived but ‘false’ or harmless threat such as the proximity of some harmless but unfamiliar object. In performing the escape reflex action, the bird jumps into the air and takes flight to seek a higher perch where it will feel more secure as it can then look down, safely on the danger. Only once air-borne, a second or two after the reflex action comes into play, does the bird have voluntary control of its own movements. 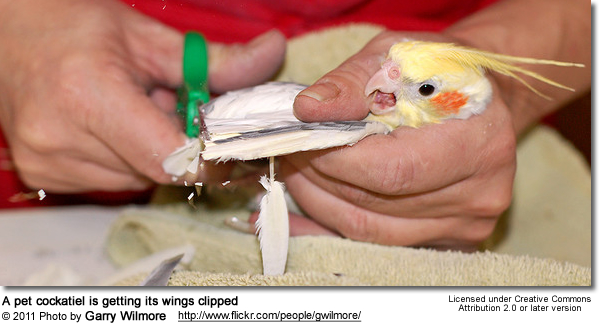 Clipping a bird prevents it from exercising this most vital predator-avoidance response. It is the frustration of this response caused by wing-clipping which causes many parrots great psychological stress. Some birds transfer this frustration into maladaptive behaviours such as feather plucking, self-mutilation, biting or screaming. With their freedom to move so limited, others may become ‘behaviourally tethered’ to their cage or stand, defending this space aggressively against anyone else. Moulting and re-growth of feathers can mean further problems for clipped birds. Most people who clip birds’ wings don’t acknowledge the importance of flight to birds as part of the normal behavioural repertoire. Often there is a lack of information on the evolutionary pressures which resulted in birds perfecting a flying lifestyle over million years. Also, many parrot people do not inform others of the details of the moulting sequence or rate of growth of flight feathers. The following paragraph details these last points. Most parrots have 10 primary feathers which are attached to the ‘hand’ and 12 secondary feathers which are attached to the lower forearm (ulna). These feathers are numbered, anatomically, in a standard way, as you look at the bird’s outstretched wing. Primary number 1 (P1) is the innermost primary. P10 is the outermost primary. The outermost secondary is S1 (this is next to P1). The innermost secondary (next to the bird’s body) is S12. Healthy parrots moult in a set way. The middle primary, usually P6 is the first feather to be dropped from both wings and growth of the new replacement feathers start immediately. Most parrots grow their feathers at a rate of 3 – 4 millimetres every 24 hours. You can usually see the growth rate of a feather as alternating narrow parallel dark and pale bands across each feather when this is viewed in good, bright daylight. Once the new P6 is part grown, P5 and/or P7 will be moulted and start to be re-grown. Then numbers P3 and P7 etc. working in both directions along both wings at the same time. Once most primaries have been replaced, the bird starts to moult and replace its secondaries (shorter, upper "arm" feathers). The full moulting sequence for most parrots is as follows, brackets indicate feathers being moulted at the same time in pairs: P6, (P5+7) (P8+4) (P3+9) (P2+10) P1. S1, straight through to S12 at the end of the moult. This moulting sequence is an adaptation to maintain the symmetry that is so vital to flying birds. Normal healthy birds will not moult more than 3 feathers from the wing at once. Large birds with large flight feathers take much longer to grow each feather. It may take a large macaw or cockatoo more than 18 months to complete a moult. But a small parakeet may take no more than 3 months to complete the same process. However, when a clipped bird tries to re-grow its wing feathers by producing the new ‘blood’ feathers, these are liable to be damaged. This is because unlike the normal wing, a clipped wing does not have adjacent old, full-length feathers to give the new blood feathers any protection during their very delicate growth stage. Bleeding can be profuse if such a feather is damaged. Birds which do not show any behavioural problems at the time of clipping often develop problems later at this stage. They start to pick at the new unprotected feathers and this may prevent proper re-growth of all clipped feathers. If your bird is clipped, it is best to restore flight immediately by having donor feathers attached to the clipped feather stumps. This procedure is called imping and can be carried out by an avian vet. I can supply donor flight feathers from most ‘pet’ species to vets for imping. The bird should of course also be trained to accept some requests or ‘commands’ from you, including basic flight commands. Clipping to have more control over your bird. “Stay”. This means do not approach me or fly to me for the moment. "Go". Means leave me by flying off me. “Off there". Means leave your present perch and fly to another place (usually used as a saftey request). “On here” This means please fly to me now. These flight requests are taught using reward-based training methods; the bird gets something he really likes such as scritches, a favoutie toy or favourite food treat while learning the new requests. Once learnt by the bird these requests gives carers all the control they need of their bird. One major advantage of training a bird the basic flight requests is that should the bird ever escape, it can be much easier to get it back once you have spotted it, since trained birds tend to still accept these requests by the person they are bonded to even when they are outdoors. Having kept parrots for over 20 years, I have had quite a few birds escape. 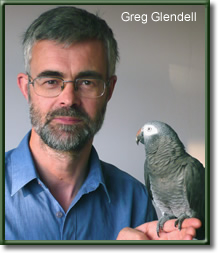 However, I have never lost any trained birds, and only ever lost one untrained one (in 1992). I have recovered escaped Amazons, greys, conures and Meyers parrots by this means. Prospective buyers of parrots are often not told about the serious consequences of wing clipping especially as regards young birds. These problems do not often appear until many weeks or months after the bird is in its new home. Since the basic training can give you good control of a flighted bird there is no need to have any bird clipped. It only takes a few minutes to clip a bird’s wings but it can take months or even years (and expensive vet’s bills) to correct the problems that wing-clipping can cause. Birds trained to accept a few extra ‘requests’ from their main carers can of course spend much more time out of their cage since they cause fewer problems while enjoying valuable time with you and the relative freedom that this gives them. Flying birds also get good effective exercise and this makes them much fitter, healthier birds than those which cannot fly. Parrots are very different from the usual domesticated creatures kept as pets. Even captive-bred birds remain essentially ‘wild’ animals with a vital need to perform as many of their natural behaviours as possible each day of their lives. This should include daily periods of flight, even if this is only indoors. With this in mind, parrot owners should be prepared to adapt their homes, at least to a certain degree, to the bird’s needs, instead of adapting the bird, by clipping it and disabling it for their convenience. Flight is something to be encouraged in parrots; not something which should be denied the birds almost by default. By teaching birds some basic flight requests, carers can have all the ‘control’ they need of their flying bird, and the bird will be fitter, stronger and healthier in many ways.